about the discovery, which had not been made actually. are serious historical reasons for this. his rule Egyptian troops reached the fourth cataract of Nile. Amenhotep I laid a temple and a residence of governor of Kush. father, the founder of the XVIIIth dynasty. Architectural fragments with the name of Amenhotep I were found in El-Kab, Kom Ombo, Elephantine island and also at Serabit el-Khadim in Sinai. The settlement of Deir el-Medina was founded on the west bank of Nile at Thebes. It was settled by artists, craftsmen and artisans who worked at the building of royal tombs in the Valley of the Kings. It is during the reign of this Amenhotep when the royal tomb was separated from the mortuary temple for the first time. The sanctuary of Amenhotep I, named Men-set, constructed in the rocks of Deir el-Bahri was, probably, later demolished during the construction of the funerary temple of queen Hatshepsut. Still the king who ascended the throne at a very young age always lived in the shadow of his mother, the Great Iahmes-Nefertari, who seemed to be the real inspirer of Egypt’s renaissance. Along with political activity she reformed many of the religious norms of that time and became the first well-known “God’s Wife of Amen”, high priestess in Karnak, the founder of the famous temple school for priestesses and the organizer of famous festivals for worshipping Amen in Thebes. 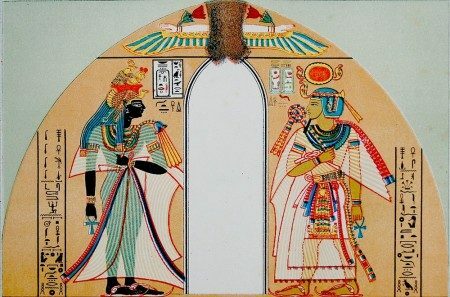 That is why Iahmes-Nefertari and Amenhotep I were deified posthumously and were worshipped as the patron saints of Thebes and especially of the Necropolis, where their names were remembered and honored centuries later. pharaoh Ramesses IX’s reign but it has not been identified yet. in the Valley of the Kings (KV39, AN B?). It must be mentioned that even different sites of the Theban necropolis were unified under one place in the “sensational” news reports. Meantime, the mummy of the king was discovered among the remains of other pharaohs, at the Deir el-Bahri Cache (TT320), where it was placed by the priests that wanted to save it from plunder. Egyptologists Emile Brugsch was the first European who descended into the Cache on 6 July 1881. 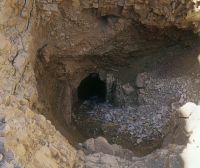 What he saw at tó mine and in the crumbling surpassed his expectations and even the stories of the locals who discovered the Cache. Brugsch wrote, “Soon we came upon cases of porcelain funerary offerings, metal and alabaster vessels, draperies and trinkets, until, reaching the turn in the passage, a cluster of mummy cases came into view in such number as to stagger me. Collecting my senses, I made the best examination of them I could by the light of my torch, and at once saw that they contained the mummies of royal personages of both sexes; and yet that was not all. Plunging on ahead of my guide, I came to the end chamber., and there standing against the walls or here lying on the floor, I found even a greater number of mummy-cases of stupendous size and weight. Their gold coverings and their polished surfaces so plainly reflected my own excited visage that it seemed as though I was looking into the faces of my own ancestors. I was not sure whether it was a dream or the reality. I took a look at one of the tomb-chests and read the name of Seti I, the father of Ramesses II. Just a few steps from it Ramesses II himself lied in modest tomb with his arms folded. The deeper I was going into the gallery, the more treasures I discovered. Amenhotep I here, Ahmose I there, three Thutmosid pharaohs, queen Iahmes-Nefertari – all in all 37 coffins with well-preserved mummies of kings, queens, princes and princesses”. Among all this royal mortals Amenhotep I occupied a special place as a divine king, who became the example of the ideal ruler of Egypt together with his mother. In the ancient times when the Cache was founded, his body was the first to be transferred there in order to consecrate the place for other pharaohs. His mummy, restored during the last reburial, was swathed with special accuracy and covered with flowers. For urgent burial of the king the coffin of the “wab” priest Djehutimes was made over and provided with necessary regalia and texts. The mummy of Amenhotep I was not unwrapped and is kept at the Egyptian Museum in Cairo. His name on the shrouds accompanied with the unusual title “iti ni Kemet” which means “the Father of Egypt”. To crown it up: the tomb of Amenhotep I will have been uncovered at least twice by the time it is identified: by the robbers indirectly mentioned in the Abbot Papyrus and by the priests, who took the king”s body for its reburial. Practice shows that royal tombs, from which the mummy was taken, became the subject of robbery at once. When Dr. Hawass was talking about potentially great discovery, he meant of course great archaeological value of such discovery and possibly the remains of funeral implements, similar to those that were found at the sacked tombs of Thutmose III, Amenhotep II, Thutmose IV and Horemheb – i.e. cracked vessels, wooden statues, faience amulets and many other objects, that were scattered among the rock fragments and sand on the floor of former “houses of eternity” in the Valley of the Kings. Member of the International Association of Egyptologists. 1.Amenhotep I as Osiris. Limestone. London, British Museum. 2.Statuette of Iahmes-Nefertari. Wood. Paris, Louvre. 3.The mummy of Amenhotep I from the Deir el-Bahri Cache. Cairo, Egyptian Museum. 4.The Valley of the Kings. Entrance into the tomb KV39 attributed to Amenhotep I. 5.The image of deified Amenhotep I on the mummy-case of the priestess of Thebes of the XXI dynasty. London, British Museum. Posted in Egyptian HistoryTagged God, Egypt, Valley of the Kings, Nile, Ancient Egypt, Amenhotep I, Dra Abu el-Naga, Qasr IbrimcommentLeave a Comment on 2005: The lost tomb of “the father of Egypt”. Discovery that has never been made!